It’s one of the most compelling narratives in all of Scripture. So fascinating is the scene, in fact, that Luke opted to record it in detail. 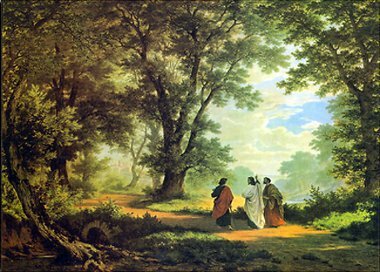 Two disciples are walking down the dusty road to the village of Emmaus. Their talk concerns the crucified Jesus. Their words come slowly, trudging in cadence with the dirge-like pace of their feet. “I’m sorry, but I couldn’t help overhearing you. Other travelers make their way around them as the three stand in silence. Finally one of them asks, “Where have you been the last few days? And he continues to tell what has happened. two sincere disciples telling how the last nail has been driven in Israel’s coffin. God, in disguise, listens patiently, his wounded hands buried deeply in his robe. He must have been touched at the faithfulness of this pair. Yet he also must have been a bit chagrined. and these two were worried about the political situation of Israel. Words painted gray with disappointment. What we wanted didn’t come. What came, we didn’t want. The foundation of our world trembles. wondering what we did to deserve such a plight. God could be the fellow walking next to us and we wouldn’t know it. but a lack of vision. Their petitions were limited to what they could imagine—an earthly kingdom. Jesus would have spent the next forty years training his apostles to be cabinet members. You have to wonder if God’s most merciful act is his refusal to answer some of our prayers. We are not much different than burdened travelers, are we? We roll in the mud of self-pity in the very shadow of the cross. if everything doesn’t go our way. we’d stop complaining that he hasn’t healed this earthly one. as it is that we don’t know the right thing for which to hope. Hope is not what you expect; it is what you would never dream. It is a wild, improbable tale with a pinch-me-I’m-dreaming ending. It’s Abraham adjusting his bifocals so he can see not his grandson, but his son. but with Elijah and the transfigured Christ. It’s Zechariah left speechless at the sight of his wife Elizabeth, gray-headed and pregnant. that the hands from which it is offered are pierced. Hope is not a granted wish or a favor performed; no, it is far greater than that. out of our socks and be there in the flesh to see our reaction. in their house in Emmaus, he "vanished from their sight" (Luke 24:31). The recognition and the disappearance of Jesus are one and the same event. now lives in them ... that they have become Christ-bearers. they can receive good counsel. He has become one with them. He has given them his own Spirit of Love. the companion of their souls. but Christ living in them (see Galatians 2:20). 17 He asked them, What are you discussing together as you walk along? the things that have happened there in these days? 19 What things? he asked. About Jesus of Nazareth, they replied. He was a prophet, powerful in word and deed before God and all the people. 21 but we had hoped that he was the one who was going to redeem Israel. 22 In addition, some of our women amazed us. 23 but didn't find his body. They came and told us that they had seen a vision of angels, who said he was alive. but him they did not see. 26 Did not the Christ have to suffer these things and then enter his glory? Jesus acted as if he were going further. Stay with us, for it is nearly evening; the day is almost over. broke it and began to give it to them. and opened the Scriptures to us? 34 and saying, It is true! The Lord has risen and has appeared to Simon. and how Jesus was recognised by them when he broke the bread.